Commissioned by the owner as a partial replica of a South Florida residence, Lurie Lane reflects the reality of that home. This version includes the living, dining and kitchen areas from the central part of the house, along with the master bedroom and bathroom. We added a loft overlooking the living area, highlighting the open and sparkling personality of the house so valued by the family. 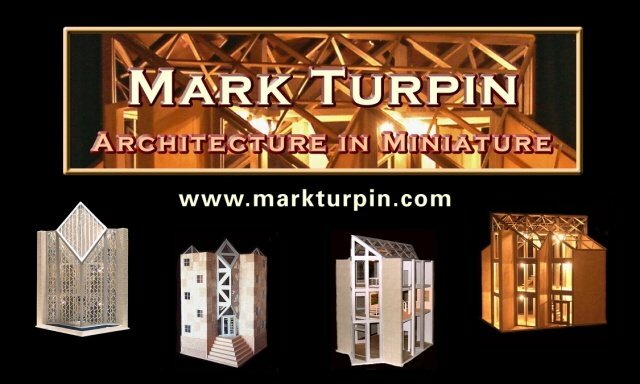 The owner of the Lurie Lane replica spent years collecting and commissioning furnishings and accessories for the miniature house that Mark produced, and she graciously agreed to share the furnished rooms with us, photographed by Mark Turpin and featured in Miniature Collector Magazine. Lurie Lane is 52"W x 28"D x 24"H. Sold. Lurie Lane was featured on the cover of Miniature Collector magazine, February 2008 issue, in the March 2007 issue of Dollhouse and Miniature Scene, and in the July 2007 issue of American Miniaturist magazine. Open House — Come In!